A couple years after The Ballpark was complete, Tom Schieffer expressed a thought that I have agreed with since the opening of the park...it's a tad too big. If there were one thing they could take back (if they had the chance), it would be about 5,000-7,000 fewer seats. The Ballpark can hold just over 50,000 fans - by far one of the largest capacities of any of the new stadiums. Most stadiums are comfortable with a capacity of 40,000-45,000. Those 50,000 seats are full only 2 or 3 times a year, so revenue is not much of an issue here. With that in mind, here's where the change begins to take place. In the upper deck in left field, remove the first 5 sections of seats starting from right to left (first photo on right). Flatten (or level) the section - flush with the surrounding walkway. 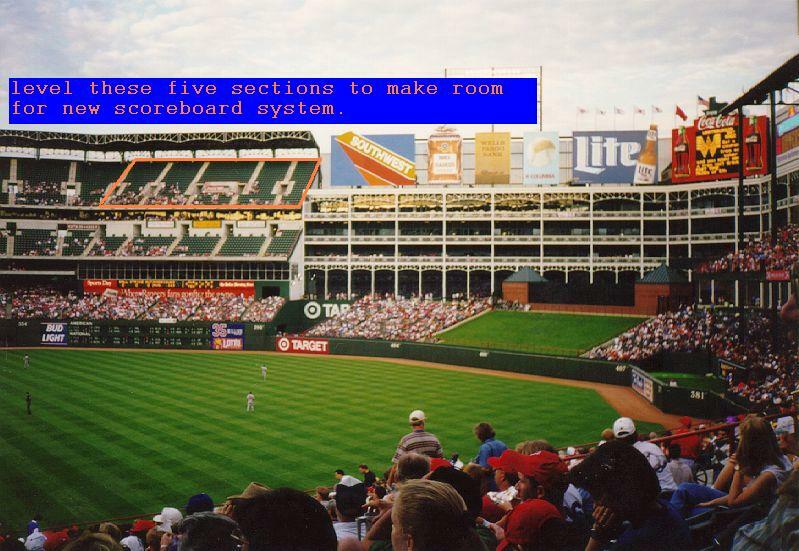 Replace the section with a new scoreboard system and, of course, billboards. This solves several problems. (1) Currently, there is only one "Jumbo Tron" in The Ballpark; it sits atop the Home Run Porch. So the fans seated in right field cannot see replays, video highlights, or most of the entertainment provided in-between innings. This seems to be one of the most voiced complaints of The Ballpark. 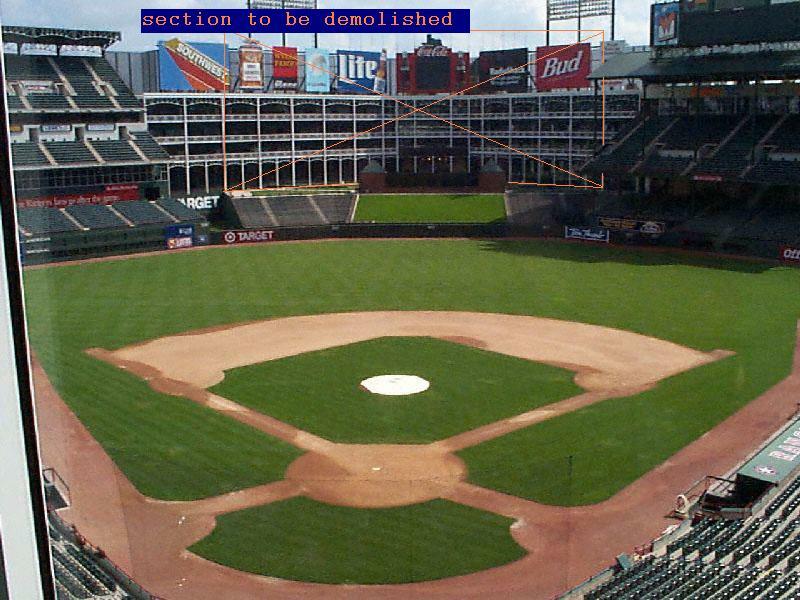 (2) The Ballpark can now have one of the newer versions of "Jumbo Trons," a longer "HDTV-style" digital screen. (3) The extra "Jumbo Tron" can serve as yet another source for advertising...something essential to professional sports. 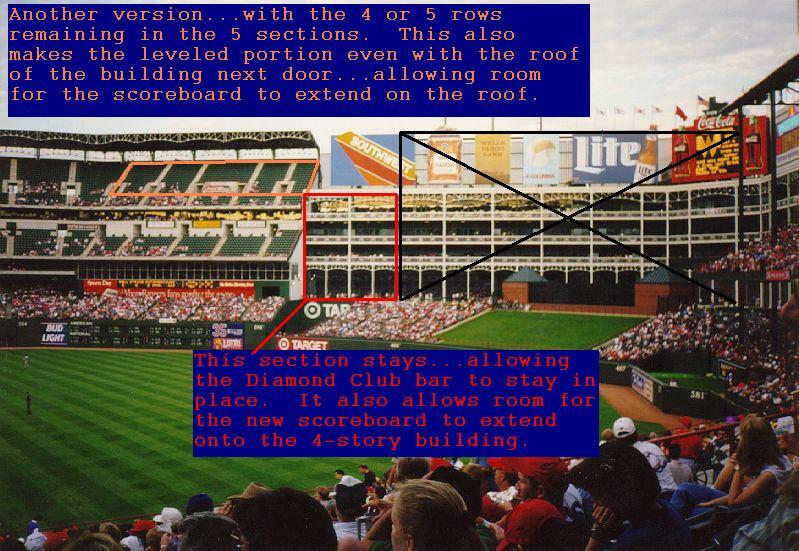 There is even the possibility of leaving the first 4 or 5 rows of seats in that section sitting in front of the scoreboard system (second photo). The Rangers can use those 4 or 5 rows as a promotional tool, such as "Coca-Cola Crazies" for fans with painted faces or wild costumes (just an example). Other ballparks have similar sections, such as Enron Field's left field bleachers, Coors Field's "Rock Pile" section in center field, PacBell Park's right field bleachers. Once this is complete, the major change occurs...tear down the office complex! Now...I do understand there are purposes beyond just office space for the complex. For instance, it holds extra room for Friday's Front Row Grill, a bar for The Diamond Club, and even a radio station. However, notice that those just listed are on the far ends of the complex. Leave one section on the left, and one section on the right to house the bar and restaurant (second and third photo). The radio station can be moved either into the remaining space or to the new complex. And again, any other office or retail store will have to be moved. That completes the huge task of phase two.